Are you a trade customer? If so please call for your preferential trade pricing. The Blustream CM100 is a IP Multicast Control module for TCP/IP, RS-232 and IR control of Blustream Multicast systems. As discussed on the Multicast Transmitter and Receiver product pages, the Blustream CM100 is the control module required for integration of your Blustream Mutlicast system in to your home control-automation product. The Multicast automation integration is compatible with most mainstream home automation products such as Control4, RTI, Elan, Crestron and Savant. 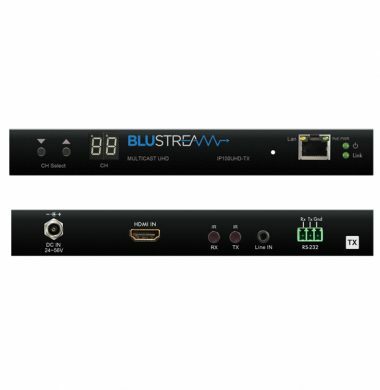 The Blustream HEX100ARC-TX-V2 is one of the Platinum Range of HDBaseT products offering all the features of HDBaseT plus ARC (Audio Return Channel from the screen back to source – requires an ARC compatible receiver). 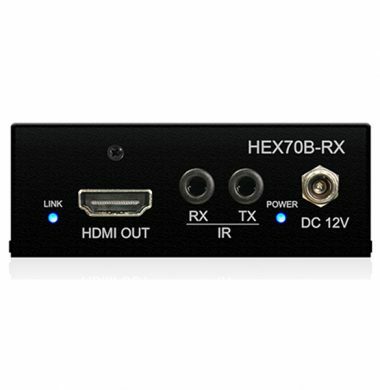 The HEX100ARC-TX-V2 transmitter includes 4K UHD, HDBaseT solution delivering HDMI with HDCP 2.2 support, Bi-directional IR, RS232 pass through and PoH (PoE) up to lengths of 100m over a single CAT cable. The HEX100ARC-TX-V2 also provides enhanced features including HDMI loop-out , ARC via HDMI or Optical (S/PDIF) and an integrated 3-port Ethernet switch. 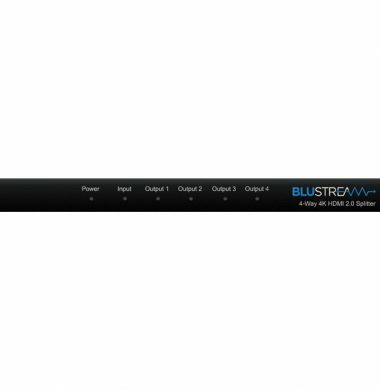 The Blustream Platinum Range of HDBaseT products offer the very best in performance and flexibility. 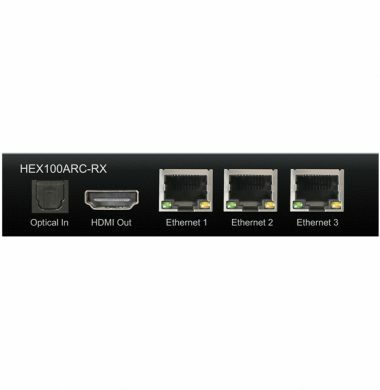 The HEX100ARC-KIT-V2 is an industry leading 4K HDBaseT Extender delivering HDMI, Bi-directional IR and PoH (PoE) up to lengths of 100m over a single CAT cable (4K to 70m). The HEX100ARC-KIT-V2 also provides enhanced features including ARC and Audio breakout, RS-232 pass through and an integrated 3-way Ethernet switch. The HEX100ARC-KIT-V” is enahnced with new added HDCP2.2 compatibility and a loop out feature. 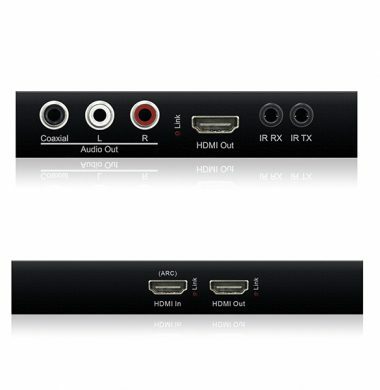 ARC – Audio Return Channel in HDMI 1.4 enables a TV to send audio data “upstream” to an A/V receiver or surround audio controller, increasing user flexibility and eliminating the need for any separate S/PDIF audio connection. The audio data is sent via a single HDMI cable. It simplifies the cable requirements, to eliminate the need for audio connectivity from the TV to the audio system. Blustream products are designed to integrate seamlessly with leading home automation control systems. Through RS-232 and IP the commands for Blustream products can be integrated easily with Control4, Demopad, ELAN, RTI and many more. The drivers can be downloaded directly from the control system website, just visit the website and click the download drivers button. The Blustream HEX70B-KIT can extend HDMI 1080p output up to 70 metres or, 4K output up to 40 metres over a single Cat.5/5e / 6 cable. So if you need to remotely locate your source device such as Sky Box, Apple TV, Blu-ray DVD player, for example, you can now simply install the slimline 26 mm Transmitter close to your source device and the Receiver close to your TV/ Display unit and still enjoy full HDMI with Bi Directional IR control from all input and output locations. With Bi Directional PoH (PoE) to power the extender from either the transmitter or receiver end, there is no requirement for additional PSU’s. 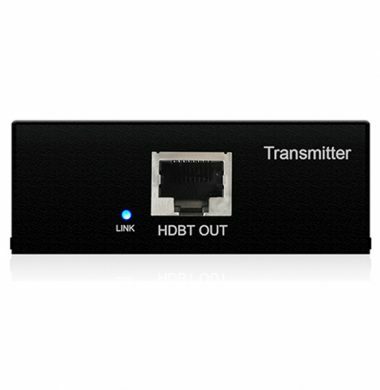 The Blustream HEX70B-TX 4K HDBaseT transmitter offers market leading features and outstanding value. The product sends HDMI, Bi-directional IR and Bi-directional PoH (PoE) up to lengths of 70m to a compatable HDBaseT receiver. The Blustream HEX70CS-KIT HDMI2.0 4K60Hz 4:4:4 (18Gbps) HDCP2.2 HDBaseT™ extender set offers market leading features and outstanding value utilising CSC technology. The product extends HDMI, Bi-directional IR & RS-232 and Bi-directional PoH (PoE) up to lengths of 70m (4K to 40m). 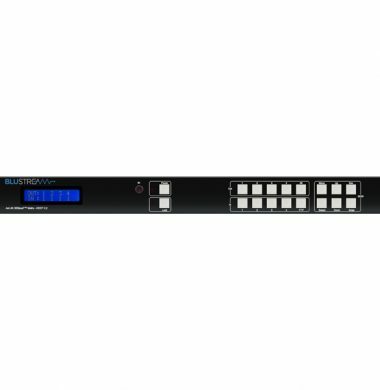 The Transmitter includes a HDMI loop-out for integrating local displays or cascading to an display device, or to multiple displays for you purchase an additional HDMI Splitter and extra kits, as each kit is point to point. 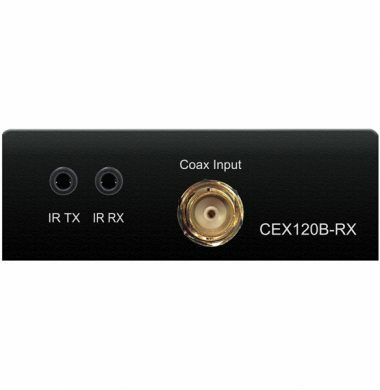 The Receiver features simultaneous analogue stereo and digital coax audio breakout. 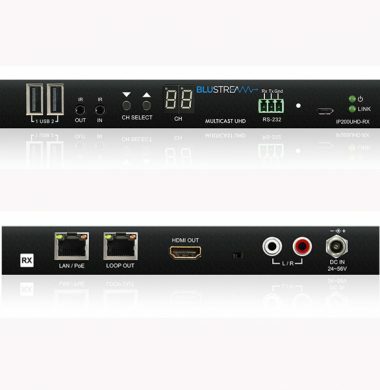 The Blustream HMXL44K-V2 it 4×4 matrix offers a new fresh approach for HDMI Distribution. It is a 4K matrix package delivering Bi-Directional IR and PoH (PoE) up tp lengths of 70 metres over a single Cat.6 cable (4K – 40 metres). 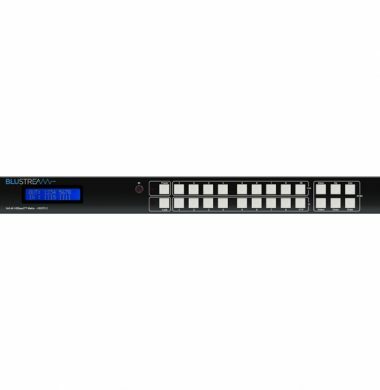 The matrix also provides advanced features including Audio breakout, simultaneous HDMI outputs and RS-232 pass through to enable 3rd party control of displays, Web Gui easy Configuration, HDCP 2.2 and Line Level Control via the matrix. The HMXL44KIT-V2 is supplied with 4 x HEX70ED Receivers. The Blustream HMXL88 – l 8×8 HDBaseT™ Matrix offers unprecedented performance and value for the custom installation market. The HMXL88 is a 4K UHD 8×8 matrix with a combination of 6x HDBaseT™ and 2x HDMI outputs. The HMXL88 V2 is a 4K HDCP 2.2 8×8 matrix with a combination of 6 x HDBaseT™ and 2 x HDMI outputs. This allows for cost-effective integration of local displays or AV receivers within an installation. The matrix delivers HDMI, Bi-directional IR and PoH (PoE) up to lengths of 70m over a single CAT cable. The HMXL88 V2 Matrix features a web browser interface for control and configuration and can also be seamlessly integrated into 3rd party control systems using RS-232, TCP/ IP and InfraRed. 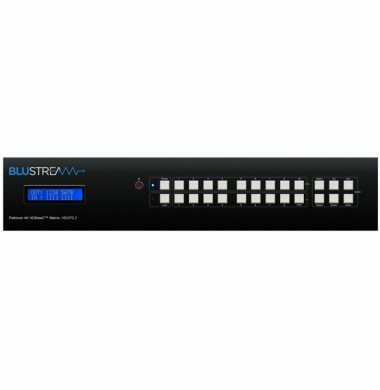 The Blustream UHD Multicast distribution platform allows virtually latency free (1 frame) distribution of HDMI video over a 1GB Network switch. The Multicast system is fully scalable and allows you to build your video distribution system as and when you are ready. 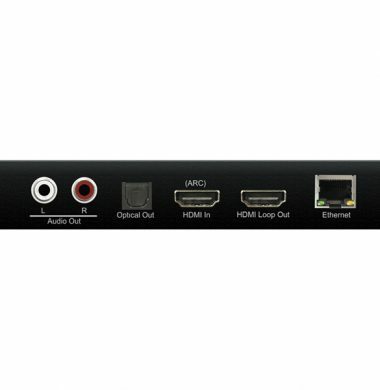 The IP100UHD-RX is an industry leading 4K HDMI receiver that uses lossless compression technology delivers HDMI, Bi-directional IR and RS-232 up to lengths of 100m over a single CAT cable. 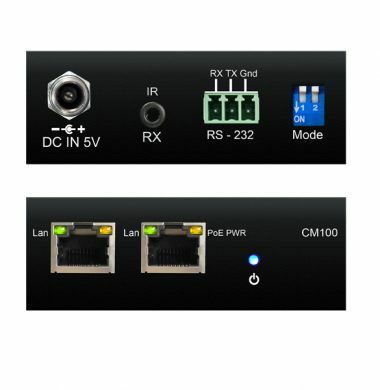 The IP100UHD-RX can be powered via PoE from the Network switch or locally should the switch not support PoE. 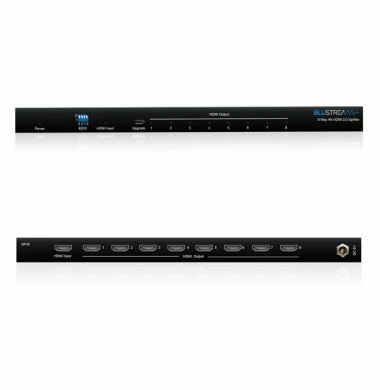 The Blustream UHD Multicast distribution platform allows virtually latency free (1 frame) distribution of HDMI video over a 1GB Network switch. The Multicast system is fully scalable and allows you to build your video distribution system as and when you are ready. The IP100UHD-TX is an industry leading 4K HDMI transmitter that uses lossless compression technology delivers HDMI, Bi-directional IR and RS-232 up to lengths of 100m over a single CAT cable. The IP100UHD-TX can be powered via PoE from the Network switch or locally should the switch not support PoE. The Blustream IP200UHD-TX is an industry leading 4K HDCP 2.2 HDMI transmitter that using visually lossless compression technology delivers HDMI, Bi-directional IR, RS-232 & USB/KVM up to lengths of 100m over standard network architecture. The IP200UHD-TX can be powered via PoE from the Network switch or locally should the switch not support PoE. With multiple configuration options available the Multicast solution is ideal for both commercial and residential installations. This presentation switch is ideally suited to boardroom, conference, educational environments. 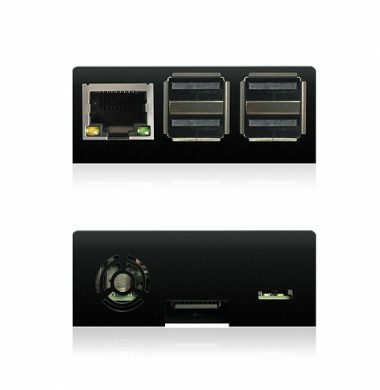 The switcher allows you to watch any video source on an HDMI display. 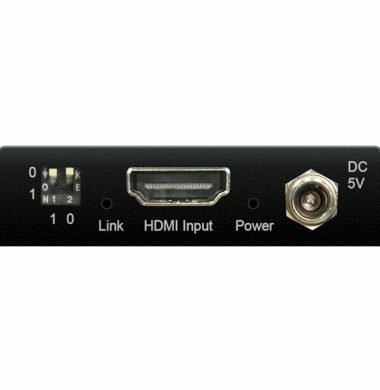 The MFP72 system incorporates a matrix allowing any video source to be displayed on output 1, whilst any of the 4 remaining HDMI’s can be displayed on output 2. 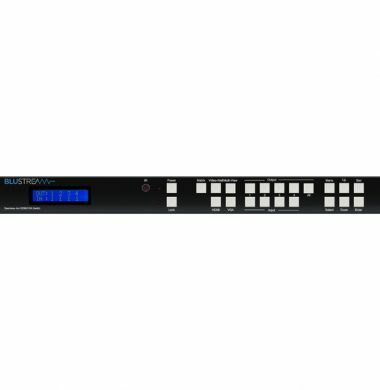 The Blustream MX44VW 4K HDMI/VGA matrix is the newest addition to the Blustream Matix range featuring a multi purpose high-speed video processing system. The MX44VW has the option to be configured in three different output options. You can choose from a 4×4 seamless matrix switcher or a 2×2, 4×1 or 1×4 video wall solution, and as a quad multi-view presentation system. The PLA66L-V2 from Blustreams’ Platinum range is a 6×6 HDBaseT Matrix, this offers a six source in and six display out function. The PLA66L-V2 delivers a range of industry leading features. It is 4K HDCP 2.2 compliant. Blustreams’ PLA66L-V2 is a 4K 6×6 matrix, transmitting HDMI, Bi-directional IR, RS-232 and PoH (PoE) up to lengths of 70m over a single CAT cable. The Blustream RX70AMP allows the audio return from the TV to play through the amplifier to your connected speakers. With Bi-directional IR receivable from lengths of up to 70m over single CAT cable,the audio from the HDBase signal can be extracted and output via either the 30W 2.1ch digital amplifier or via digital audio output. The RX70AMP also features local HDMI and audio inputs, ARC integration, line level output, EDID management and RS-232 control. The Blustream SP12AB is a compact 4K UHD HDMI Splitter which distributes a single HDMI source to two simultaneous outputs. The unit transmits all HDMI resolutions up to and including 4K UHD. The 2-way splitter also includes the advanced features of audio breakout and EDID management. 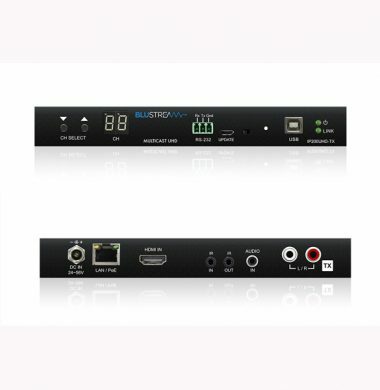 The Blustream SP12AB-V2 4K HDMI 2.0 splitter distributes a single HDMI source to two simultaneous outputs. 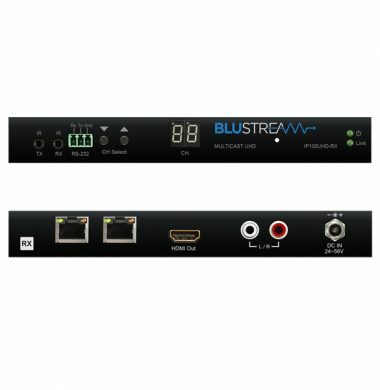 The Blustream SP12ABV2 splitter supports full HDMI 2.0 and HDCP 2.2 with video resolutions up to and including 4K @ 60Hz 4:4:4..
Blustreams’ SP14-V2 4K HDMI 2.0 splitter distributes a single HDMI source to four simultaneous outputs. The splitter supports full HDMI 2.0 and HDCP 2.2 with video resolutions up to and including 4K @ 60Hz 4:4:4. With EDID Control it is easy ot set up, While the objective of EDID is to make connecting a digital display to a source a simple plug and play procedure, issues do arise when multiple displays or video matrix switching is introduced because of the increased number of variables. By pre-determining the video resolution and audio format of the sources and display device you can reduce the time needed for EDID hand shaking thus making switching quicker and more reliable. Configuration of extender EDID settings can be achieved using the product dip-switches on the SW21AB-V2. EDID dip-switch settings are shown below. Note: You must power cycle the product after making EDID changes. 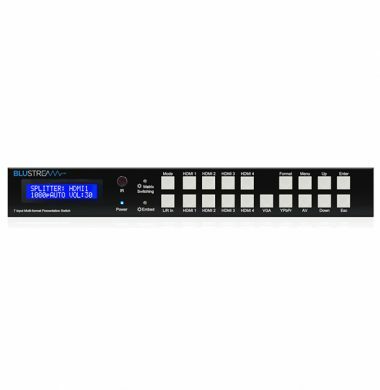 For some sources it may be necessary to power cycle the source after EDID changes have been made for the source to update its video & audio output settings.